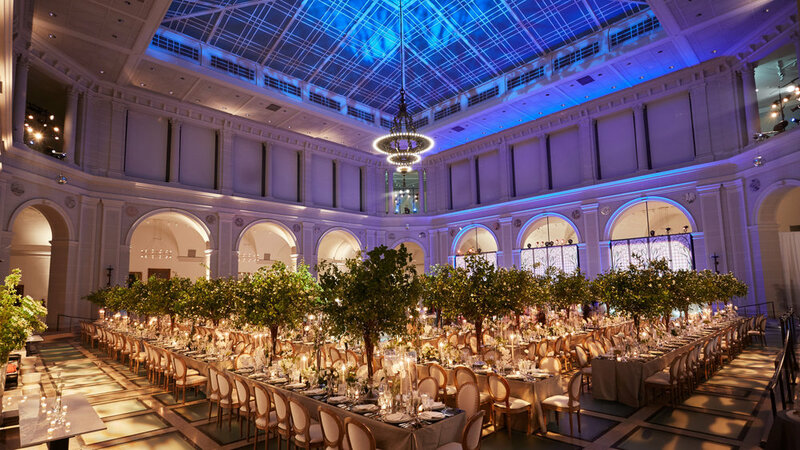 From a modern glass and steel pavilion to the grandeur of the Beaux-Arts Court, the Brooklyn Museum has a space to fit your event. Photos courtesy of Brooklyn Museum. Standing: 500 max., Seated: 300 max. Redesigned in 2004 by Polshek Partnership Architects, this modern, elegant space is 19,320 square feet and features an expansive sheer glass pavilion that overlooks our welcoming public plaza. The brick piers dividing the pavilion and adjacent lobby are the same bricks that once enclosed our five front doors, excavated, restored, and permanently exposed in the space. This grand pavilion artfully melds the historical and contemporary components of the building. Standing: 1200 max., Seated: 880 max. This magnificent, timeless space measures 10,000 square feet and two stories high, rising 60 feet above the floor to culminate in a dramatic skylight. It boasts historic features such as original archways, a large brass chandelier, and an updated glass-tile floor originally completed in 1927. Events held in the Beaux-Arts Court have included seated wedding ceremonies, holiday parties, and sit-down dinners with dancing. Standing: 415 max., Seated: 415 max. This modern, 4,700-square-foot auditorium, located in the heart of the Museum, is equipped to fulfill all the audio-visual needs of your next event. The auditorium features a stage measuring 56-by-22 feet, with a 28-by-16-foot screen that supports DVD, VHS, and 35mm projector formats. Events held in the Cantor Auditorium have included film screenings, corporate presentations, musical performances, lectures, conferences, symposia, and related activities. Standing: 100 max., Seated: 100 max. Designed by Anda Andrei, Bonetti/Kozerski Architecture and Design DPC, the space is inspired by the museum’s maze of secret and mysterious storage spaces. The restaurant affords guests the opportunity to experience the institution in a completely new way, with a sense of being admitted into the museum’s inner sanctum. The Norm is the perfect place to expand one’s mind and embrace the venue's unique culture through a fine dinning experience.